We all know photography—especially the business of photography—is about much more than just cameras and images. With this in mind I've decided to post articles under a new category entitled Other Tools. Not necessarily in-depth reviews, just quick looks at bits and pieces that are part of my daily workflow. I've tagged a few previous posts but this is the first "official" one. I've always struggled with organization. Actually no, scratch that: I've always struggled with procrastination. Ah yes, the dreaded I can get to this later syndrome that plagues so many of us. It's an emotional issue, apparently. I've always tried to overcome this, experimenting with various systems, apps, whatever. And I honestly believed I'd finally found my Holy Grail with 2DO, an app available on both iOS and OS X (soon to be macOS) that had me willingly moving forward with a more throughtful approach to the problem. It's an incredibly powerful app that deserves all the praise it's been receiving this past year and I'm sure we haven't seen the best of it yet. That said: I recently realized it was too much for me. The trap with task management is that we can end up spending more time organizing our tasks than....you know...doing them. Has to do with friction and flow: the system you use needs to become thoughtless, it needs to just disappear. As well-thought out as it is, after months of use I was still struggling to remember where certain functions were in 2DO—which means it simply wasn't the right fit for me. Before going all in with 2DO I'd given Todoist a try and dismissed it—mainly due to its SAS model. I'm not a big fan of Software As Service and the nasty surprises it can spring on users: that Premium Evernote account I switched out of last year? I paid $24.99/year CAD. Now, after two consecutive overhauls (in less than 12 months?) access to those exact same features—annoying nags et al—would cost me $89 CAD/year; we're talking a **260% **increase here. Needless to say I've been perfectly happy with Notes and I'm not looking back. But like it or not subscriptions are the new reality—all we can do is choose very, very carefully. So I downloaded Todoist again, out of curiosity, and this time took a good hard look around. It was as if a light came on: an hour later I had upgraded to Premium; by the end of the day I had everything in my life laid out more clearly than ever before, everything from work to personal tasks. And for the first time ever, I'm actually Getting Things Done. I think the cleanliness of the design plays a huge part because I don't deal well with visual clutter: my brain tires easily. When my studio is a mess I don't work as well and when an interface throws too much stuff at me, I blank out. Todoist—especially on iOS—pulls me in. I don't feel overwhelmed, even with multiple tasks thrown at me. I've kept my organization simple in order to prevent fiddling; I can switch from my iPhone to my iPad to my Apple Watch to my Mac without skipping a beat. Voice dictation and natural language parsing work very well so watchOS 3's quick launch feature will be a boon (no more waiting 45 seconds for the app to open). The service also has this feature called Karma which—honestly—felt like a feel-good gimmick at first. It's 1) a reward system based on points that you accumulate when you check-off tasks, with levels from Novice to Enlightened (!) and 2) a way to visualize your productivity through various time-based graphs. As silly as it may seem, I've grown addicted to it. Like the activity rings on the Watch, it provides a strangely compelling incentive to accomplish my daily goals. It's not perfect mind you: for one there's a bug on iOS that prevents uncompleting tasks that have been mistakenly checked off. I also wish search was easier to get to on that platform and there's no sort option to be found anywhere either (the app defaults to either date or priority depending on the view...I'm still not sure what triggers what). None of these are issues on the Mac or web versions so there should be fixes in the future. But regardless, I'm having a crazy busy summer that was in desperate need of a system to keep me on track and I seem to have found it. 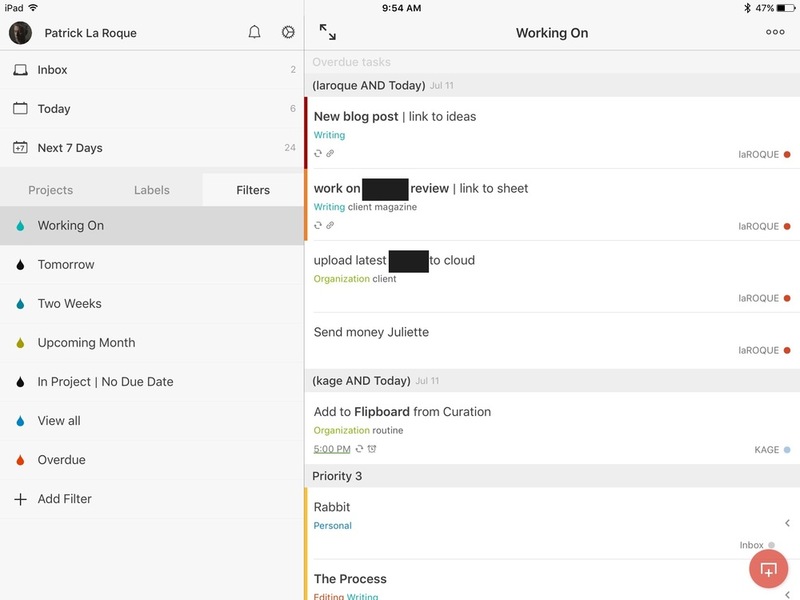 Bottom line: Todoist is quick, it looks nice and it's keeping me highly motivated. The end of procrastination? Well...fingers crossed.